English, like any language, is straightforward. Words mean what they mean. And if you believe that, you’ve been lied to. So said Humpty Dumpty in Through the Looking-glass. FACT: hundreds of English words don’t actually mean what we mean by them. 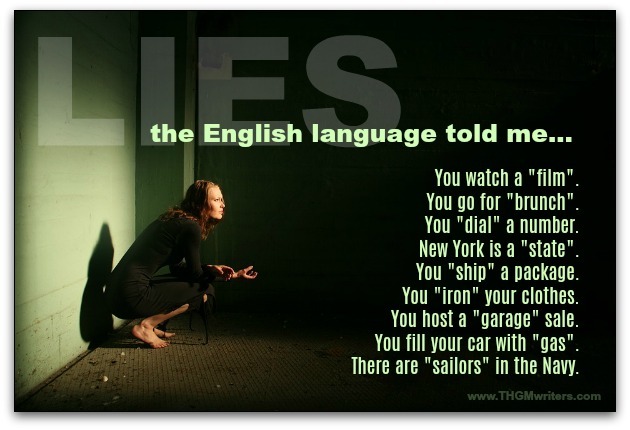 These are the little white lies that the English language tells us. We all use the words incorrectly, because if we all agree (nudge, nudge, wink, wink, say no more, say no more), then words actually take on the meaning that they don’t mean. Here are just a few examples I’ve plucked out of an ocean of misused meanings. Not all words actually mean what they mean. As Alex from 1996 asks his 2017 friends in Jumanji: Welcome to the Jungle, does “phone” have a different meaning in the future? It does. 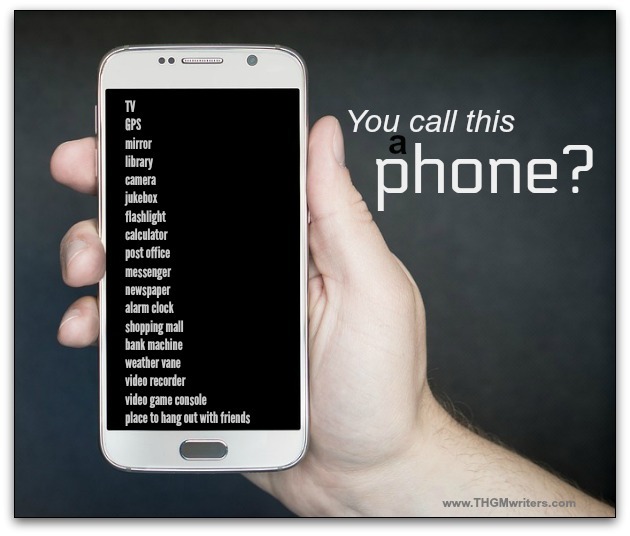 Your phone is not actually a phone. It is technically a mobile computer. Will it also soon be a masseur and a screwdriver and maybe even a teleportation device? Stay tuned. Speaking of “computers”, it appears that the English language thinks I use my desktop and laptop, not to mention my tablet, for computing. Ha! The fact is that I rarely use the calculator function on any of these. I recall the first computers. They took up an entire room and punched out data on yellow or blue cards. Back then, a computer computed. That’s before Apple and Microsoft realized that the increasingly compact machines could do more useful things, such as sharing lolcats and “liking” indie bands. My desktop is a meeting place and a communications hub. It is my library and my newspaper. It is my post office and my typewriter. But it is not my computer. When was the last time you dialed a number? I remember when I was a kid. We had a black phone with a black handset connected to it by a black spiral wire. We put our finger in a hole and dialed a number. And it hurt. The metal edges of the holes became sharp if we had a lot of dialing to do. Newer phones had plastic dials that hurt less. Then came touch-tone. Then came cell phones. Then came voice-activated “dialing”. Then came thought-control phones… Oops, I think I’m getting ahead of technology. I haven’t dialed a number in decades! I haven’t dialed a number in decades. Let’s get one thing straight. That box you use to heat up your food is an oven, not a microwave. Specifically, it is a microwave oven, because it uses microwaves to heat your food. Ovens are things you put food into for heating. You can see ovens. When was the last time you went to see a film? If you are under 40, probably never. Film is old technology. We no longer record video on film. We record it digitally these days. I no longer iron my clothes, mostly because I am lazy and starved for time. And my clothes don’t wrinkle that badly. Plus, there is no such thing as an iron in the 21st century. Now we aluminum our clothes. What we call an “iron” is made of aluminum or an alloy of aluminum and steel. You don’t own a curling iron, either. You actually own a titanium. Or a chrome. Or a ceramic. Or a tourmaline. Or a Teflon. Curling irons are made of various materials, in fact, including almost every metal … except iron. Remember those 2oth century incandescent light bulbs? I know, I still have some of them around the house, too. Those actually are bulbs. Those fluorescent bulbs? They are not bulbs. “Bulb” is a shape. You might have fluorescent tubes. You might have fluorescent spirals. But I doubt you have fluorescent bulbs. CAVEAT: There is nothing to stop somebody from wrapping a bulb around a compact fluorescent spiral, thereby making it a “light bulb”. Do you wear running shoes or sneakers? You might. But more than likely, you don’t. I run from time to time, so I wear running shoes. I don’t do much sneaking, so I don’t wear sneakers. Ships sail from one port to the other. Just kidding. The fact is that most ships haven’t sailed for a century. Once humans learned to harness the power of steam, we folded up our sails. As for sailors, they went the way of the moat diggers. We have seamen and deckhands, but we do not have sailors on modern ships. Produce (grains, fruits, vegetables, etc. Anything produced in bulk in one part of the world gets shipped by ship, which are really, really, really incredibly large boats. It’s too small to receive a ship. There might be times when you are in a state of confusion, perhaps a state of intoxication, but never in the state of New York. A state is a sovereign country. Many of the framers of the US constitution felt that each of the 13 colonies was its own country. They were sovereign states. They were simply united in order to do certain things. Is it time for #Wyoming to take its seat at the United Nations? Over time, the federal government grew more powerful. The United States is a state, recognized as a country around the world. New York is not a state, nor is California or Wyoming. Could you imagine Wyoming showing up at the United Nations trying to take its seat? No, Texas is not a state, either. a lowered level of consciousness marked by listlessness, drowsiness, and apathy. When you’re running on empty, you fill your car up with gas, right? Wrong, for two reasons. First, if you filled your car with gas, you’d drown your passengers. You fill your tank, not your car. Second, if you really did fill your tank with gas, you couldn’t drown them. You can drown people only with liquid. When anything gets cold enough, it solidifies or freezes. It becomes solid. The point at which it becomes solid is the “freezing point”, which is different for each substance. For water, that’s 0º Celsius (32º Fahrenheit), and we call it “ice” when it freezes. When anything gets hot enough, it evaporates. It becomes gas. For water, the boiling point is 100º Celsius (212º Fahrenheit), and we call it water vapor. (Yes, all liquids evaporate at almost any temperature, but this is not a physics class). Handy tip: fill your gas tank with liquid, not gas. In between the freezing and evaporation points, all substances are liquid. One of the reasons that Earth supports life is that our temperature is mostly between the freezing and evaporation points for water. Liquid water supports life. Back to filling up your car…er..tank. Gasoline freezes at…well, it’s complicated. Since gasoline can be made in different ways, its freezing point could be anywhere from 38º to -204º Celsius (40 to 50 below Fahrenheit). Because of the different compositions, the boiling point is trickier. It is typically from 40 to -50º Celsius (100º to 400º Fahrenheit). If you really want to fill your tank with gas, you’ll have to go someplace where they serve it up hot. However, I recommend filling your tank with liquid. Earrings are rings that you put in your ears. Some women wear earrings. Some men wear earrings. However, some people wear studs. These are not rings, so they are not ear rings. They are pins. Some women and some men wear earpins. Have you ever seen a restaurant advertise Sunday brunch at 1:00 or 2:00 in the afternoon? Perhaps you have eaten Sunday brunch at this time. If so, it’s all an illusion. You did not eat brunch in the afternoon. Brunch is a word fused from breakfast and lunch. It refers to a meal between breakfast and lunch. For instance, after 9:00 a.m., it’s hard to call a meal breakfast. But most people won’t call it lunch if it’s before 11:00. At 2:00 in the afternoon, it’s not brunch. It’s lupper. Or sunch. I’ve never been to a garage sale. But I have been to many sales incorrectly labelled “garage sale”. This is not just because the garage is seldom for sale. It’s because the sale rarely takes place in the garage or even partly in the garage. I assume that these sales used to be in the garage, but they moved outside before I came of age. That’s why many people call them yard sales now. There’s just one problem with this. These are rarely “yard” sales, either. For the most part, they are driveway sales (not because the driveway is actually for sale, but because the venue is the driveway, not the yard and not the garage). There is just something about the English language that seems designed to spread confusion. No wonder immigrants have such a tough time learning our language. English is a liar. That was a fun and eclectic post. And totally sums up why the English language is one of the hardest to master. I feel for my children sometimes as words continually change. I do remember dialing a telephone number, and now I’m continually drilling my kids to memorize my number in case of emergencies…because goodness knows, there isn’t speed dial if you don’t have your phone anymore! An entertaining read – thanks David. As for foreigners having a tough time – well maybe in some ways. I know a young German who thinks German is much more difficult than English and now thinks and dreams in English.. A young Romanian lady I know is virtually fluent in English after just 15 months here and her spelling is accurate too. She has learned simply by immersing herself in our culture. Yes, German is harder. With three genders, it can drive a man/woman/tree crazy! Hi David! That was a lot of fun to read. It reminds of a comedy set by George Carlin talking about some English expressions that have literally no meaning at all. Pretty funny how language is understood outside of what the actual words mean. Thank God for dictionaries, though. When you read old novels (or when next generations read our novels) they need to know the meaning that was most current at the time of writing the text. But it’ll be fun watching people confused about meanings just because technology advances so fast, barely anyone is catching up. Thanks again for such fun content! Great post, David. On another note and for someone who grew up and learnt the Queen’s English on the other side of the Atlantic, you’d wonder waht my state of confusion was when I came over to the US almost 23 years ago. I was so confused between words and phrases like “Glove Compartment vs “Pigeon Hole”, “Hood” vs “Burnett” and “Car Trunk” vs “Car Boot”. Thanks for the interesting read. …and truck vs lorry, and fries vs chips, and elevator vs lift, and Captain America vs Doctor Who. Amazing how many instances of American vs British English having a different word for the same thing!